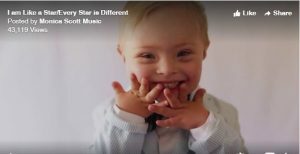 For Down Syndrome Awareness Month, Latter-day Saint musician Monica Scott created the video shown below. “I am like a Star/ Every Star is Different – Arranged by Monica Scott” combines the Primary songs “I Am Like a Star” and “Every Star Is Different” in her own musical arrangement. October is Down Syndrome Awareness Month, a chance to spread awareness and celebrate the abilities of people with Down Syndrome.